Summertime is all about fun in the sun. My family likes nothing more than to just have a blast. One of our favorite things to do in the summertime is to visit Wisconsin Dells. It’s an entire city full of fun and wonder – you’re never crying about being bored! Wisconsin Dells happens to be the Waterpark Capital of the world and one of our absolute favorites is Kalahari. They’ve got indoor and outdoor waterparks with fun slides for the whole family, an indoor theme park, arcade and so much more. This summer, they’ve got a special Summer Splash Celebration going on. It’s a one world celebration of music, food and art surrounding Kalahari’s African roots. They’ve got an entire team dedicated toward activities and they’ve got all sorts of fun games, crafts and more lined up for the entire summer! You should also be on the lookout for an Elephant Encounter and a Chef’s Harvest experience. They’ll post specific dates to their website soon! My family is really excited to take out next trip to the Dells and visit Kalahari next month. A few weeks ago I got an exciting package in the mail from them, a Kalahari Press Crate chocked full of fun! I couldn’t wait to open it up, but I adored the box so much that I had to take photos. The kids actually have plans for this baby, a place to store their treasures from all of our family vacations – how fun! After I opened up the box, I couldn’t believe how much great stuff was packed inside. It felt like my birthday – complete with all sorts of great Kalahari swag! I was very pleasantly surprised and can’t wait to wear all of our goodies when we visit! 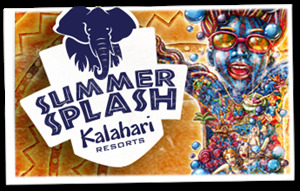 You’ll have to be sure to stop back and check out our experience at Kalahari next month. I have written a few other articles about Kalahari that you might enjoy reading for the time being. Giveaway Winner: Entry #235Sadie B.
I received a sample product for this review. All opinions are my own and/or my family’s, take it or leave it. Click here to view my whole disclosure policy.